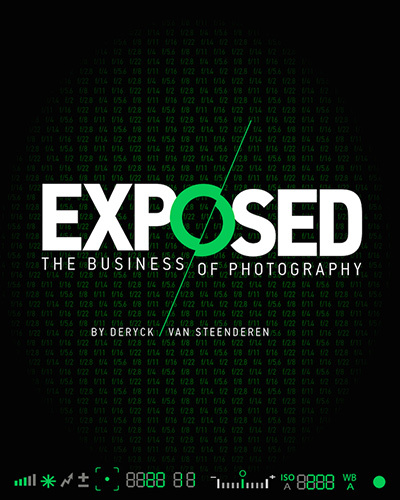 The 157-page book Exposed - The Business of Photography (for South Africa) by international photographer and film director Deryck van Steenderen was written with the intent to prepare every aspiring photographer for the challenging photography industry. It includes plenty of tips and tricks that will give you the power and know-how to make a success of your career as a photographer, doing what you love. Exposed is aimed at the South African professional photography market keeping local law and photographic trends in context. This revised edition ensure buyers of timely and accurate information based on new industry developments and reader feedback. At the time, Deryck thought he was just being negative, but many years later he now understands what the challenges were. The author shares that he read countless books and magazines on photography and photographers but none of them really prepared him for the reality of the actual business of photography. In 2015, the Mail & Guardian published an article on Deryck exposing the "lack of education around copyright infringement and how general business savvy is a huge cap, particularly in tertiary education." Whilst honing our technical and creative skills as a photographer we also need to hone our business skills, without which we are unlikely to succeed as professional photographers. Our goal should be to have a financially viable, sustainable career producing the best work possible as professional photographers. A financially viable and sustainable career means one in which we are able to live a decent lifestyle, whilst making provision for our retirement at the same time. Just as every other career deems this normal, so should we. Deryck is a commercial photographer, based in Cape Town, working internationally on assignments from lifestyle to fashion and beauty, food and decor, portraits and travel.